Whether you are a sports gambler or not, odds tell a great story about how a team performs under many different circumstances. They paint a picture of how a game is supposed to go and give some context about how well (or poorly) a team has played over the course of a season. 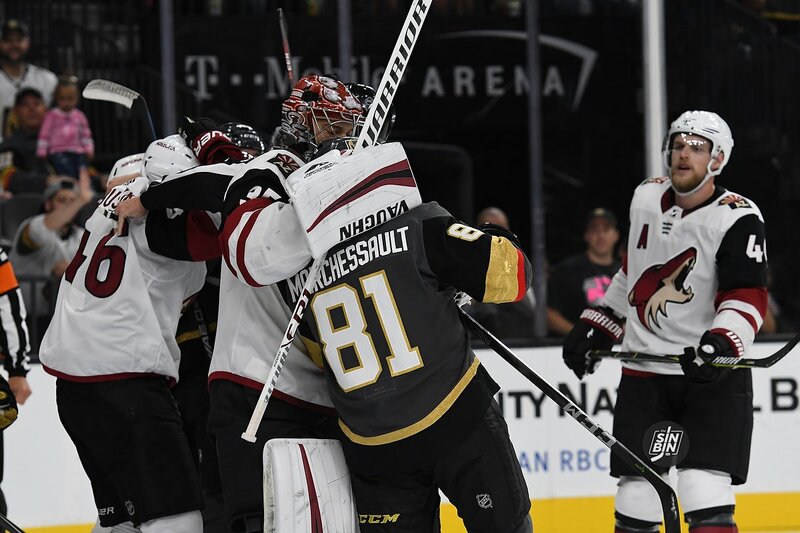 The Golden Knights have played 68 games to this point winning 37 and losing 31 as overtime/shootout losses are losses in gambling terms. A $100 bettor (see end of article for explanation of how this works) would be down $360 if he bet on every Golden Knights game this season. Vegas has been favored in 55 of the 68 games. That same bettor would be up $305 on the Golden Knights’ 35-20 record as favorites. The Golden Knights are a dismal 3-10 as underdogs. Their three wins are all as minuscule dogs too, winning at Minnesota (+100), at Philadelphia (-105), and at Tampa Bay (+135). Bet all 13 and you’d be down $665. Vegas went on an eight-game losing streak as underdogs spanning almost 4 months from mid-October to early February (115 days). However, despite a total road record of just 16-16-1 on the road the Golden Knights make bettors money when they are favored away from home. That’s happened 20 times this season and the Golden Knights are 13-7 earning a total of $345. The worst loss as a road favorite was just -155 at Los Angeles, while the Golden Knights have covered games as large as -185 (@ANA), -170 (@CHI), and -165 three times (@DET, @VAN, @OTT). There is one other situation in which the Golden Knights pay off. 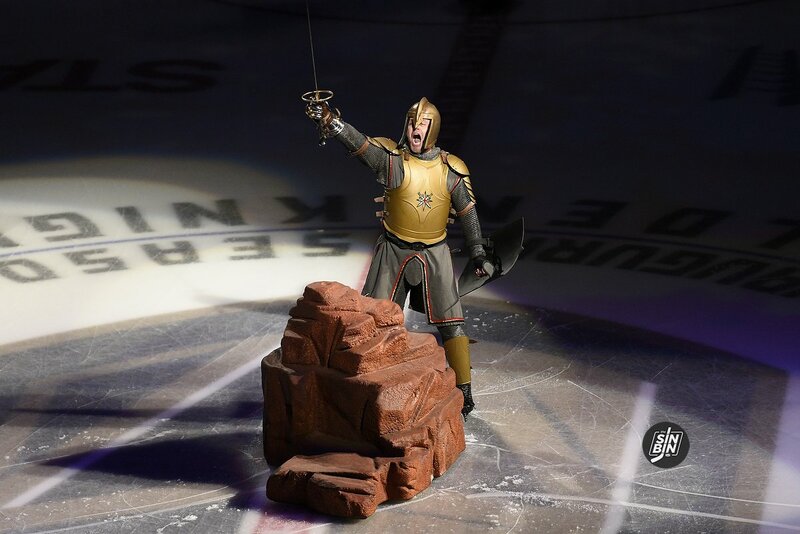 The world’s greatest sportsbook, and the only sportsbook in the history of the NHL to strike a deal with a franchise, William Hill, has released a bunch of props on the Vegas Golden Knights. Not only do they have the standard “futures” which allow fans to bet on the Golden Knights to win the Western Conference or Stanley Cup, but they’ve now posted individual player props for Vegas players as well. But rather than just post them, I decided to have a little fun today and actually make picks on them. Plus, at the end of each pick, a confidence level of how certain I am that my pick will be correct. Here we go! This number is pretty spot on to where I expect Karlsson to land this year so it’s actually one of the toughest ones of the group. When we wrote the “Karlsson regression” article the number it spit out was 34.3 goals, so for that alone, I’ll go with the over. I fully expect the Golden Knights top line to once again dominate games on both ends of the rink, and I expect Karlsson to be a major factor in that. However, I think Marchessault is ready to take the step into being the 40+ goal guy while Karlsson will pick up his assist total instead. The Golden Knights had just one 30 goal scorer a year ago. That number may rise to two or three, but I can’t say I’m positive Pacioretty will be one of them. That’s not to say I don’t expect Max to have a great year with the Golden Knights, it’s just that 32 goals is a lot to ask, especially when he doesn’t have a clear line to play with out of the gate. He’ll certainly be paired with Paul Stastny, but it might be a revolving door as the third man on that line which will stunt production a bit. Also, Pacioretty and Stastny were brought to Vegas to sure up the defense on the 2nd line. That’ll be as much a focus as scoring, and no one on the 2nd line scored 30 a year ago. This is the easiest of all of them for me. Marchessault should soar past 30 playing an entire season with Karlsson, Smith, and as a focal point on the power play. As mentioned in the Karlsson pick, I expect a lot of the goals from the first line to shift from Karlsson to Marchessault. Honestly, it wouldn’t surprise me in the least if Marchessault ends up closer to 50 than he does 29.5. The world is changing all around us, especially professional sports. William Hill Sportsbook and the Vegas Golden Knights today made a joint announcement that both have reached a partnership. Thus, opening up possibly the biggest can of worms in pro sports in modern day history. The Golden Knights become the first professional sports franchise to join forces with a legal sports betting outlet. 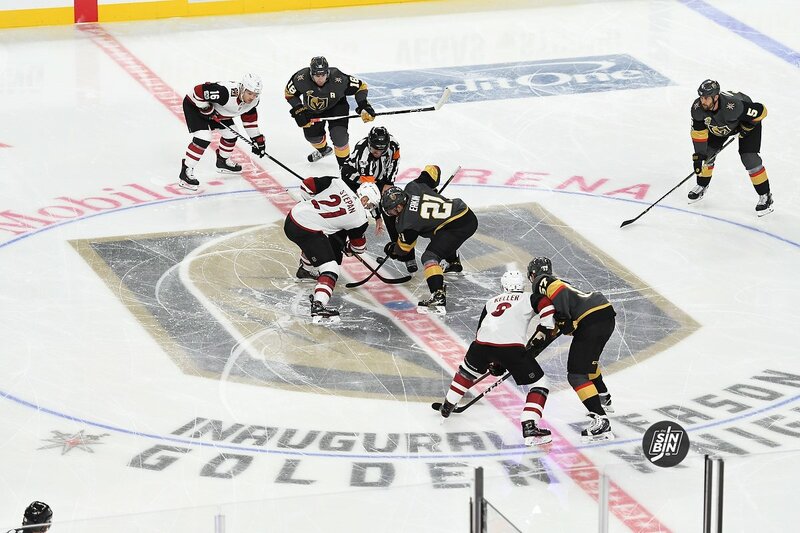 The William Hill and Golden Knights partnership will feature a dasherboard ad, in-arena signage, updated league-wide odds displayed on the Knight Tron during intermission, an away game watch party, and recognition on the LED ribbon board of the “William Hill Line Change” when the Golden Knights make a line change during the game. William Hill is the premier sportsbook in Nevada and boasts the best, and easiest to use, mobile sports betting app on the market. This is a proud moment for us here at SinBin.vegas because William Hill has been a sponsor with us nearly from the site’s inception. Now, they’ve made history breaking through the glass ceiling of partnerships with sports gambling companies and NHL teams. It wasn’t long ago that the thought of betting the Golden Knights to win anything more than the next game was considered a sucker bet. 50:1 to win the division, 100:1 to win the conference, and at a time the Golden Knights went off at as high as 500:1 to win the Stanley Cup. They cashed a bunch (wish it was all) of those tickets and this year Vegas sportsbooks have wised up. William Hill has had futures listed for the Final (VGK +900) and for both conferences (VGK +450) for a while, but now they’ve recently released the odds for each team to win their respective divisions, and to no one’s surprise, the Golden Knights aren’t longshots this time around. Oddly enough, the Golden Knights do not have the highest season point total in the division. Instead, they come in third behind the Sharks and Ducks and tied with the Kings. Remember, a lot of these numbers have to do with betting action rather than the actual belief of a bookmaker. However, it’s surprising to see such disparities between the season point totals and the division futures. On one hand, the Golden Knights are the favorites to win the division. On the other, they are projected to be right at the playoff points cut line with 95.5 points. Every good gambler knows, when you see numbers like that, something is amiss. Unfortunately, I’m not a good gambler, so I’m not sure what it is. Here are the rest of the divisions and their respective season point totals. All wagers are available now at William Hill sportsbooks in the state of Nevada and on the William Hill Mobile Sports App. A year ago the Golden Knights were slated to be the worst team in the NHL. Sportsbooks all over town listed them as high as 500:1 to win the Cup before the season and William Hill had the season point total in 2017-18 set at a measly 69 points. 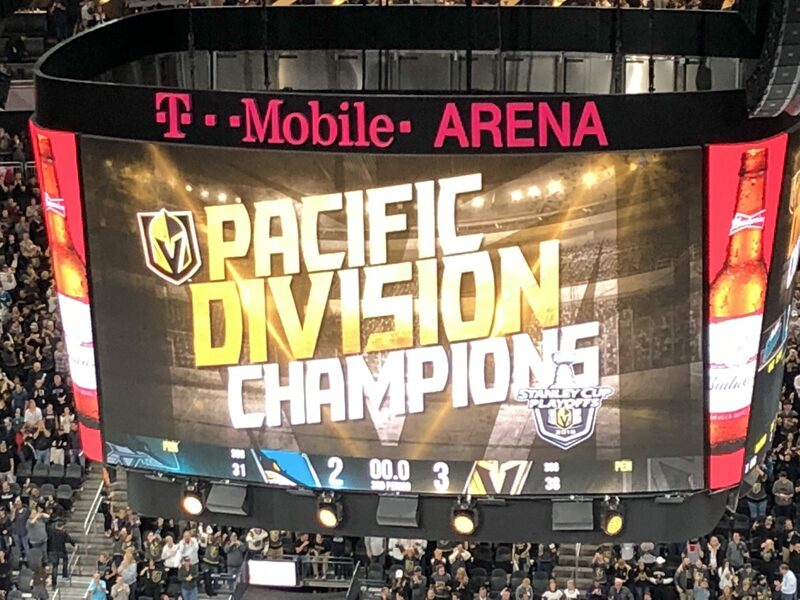 Then the Golden Knights went out and racked up 109 regular season points, won the Pacific Division, and won 13 playoff games en route to a Western Conference Championship. Needless to say, expectations have changed a bit heading into 2018-19. Recently, William Hill listed the season point total prop for the Golden Knights at a whopping 94.5 points. Plus, they’ve listed a few other betting options. And they say hockey is in the offseason. Not at the betting window, and never at SinBin.vegas. With the matchup now set our friends at William Hill have set the lines for the Western Conference Finals. For the first time in the playoffs, the Golden Knights enter as underdogs to win the series. Game 1 in Winnipeg tomorrow has the same line with a total of six goals. William Hill also offers “exact” series prices, allowing players to pick the winner of the series and the exact number of games they’ll do it in. The Golden Knights actually have one of the favored outcomes in this proposition. 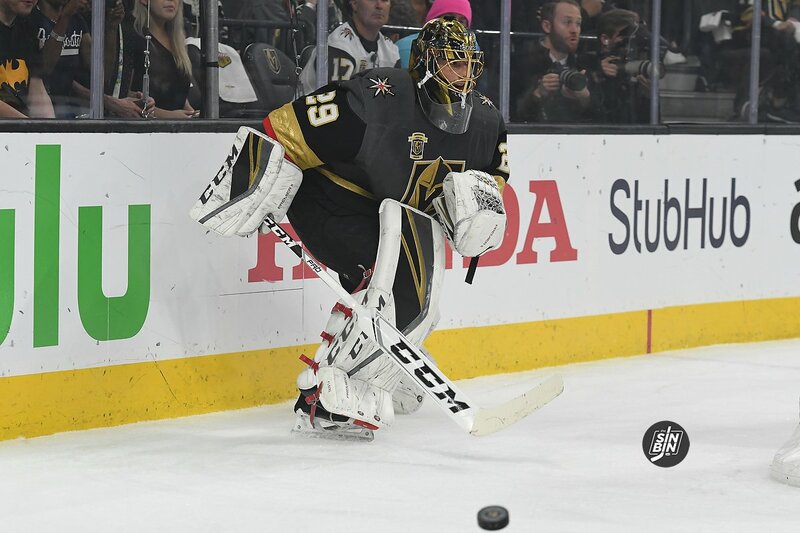 Finally, Marc-Andre Fleury, having recorded his fourth shutout of the postseason, has risen to become the favorite to win the Conn Smythe Trophy for the most valuable player in the NHL playoffs. The next closest Golden Knight is William Karlsson. All bets are available at any William Hill Sportsbook or on the William Hill Mobile Sports app. For more details click the banner on the top of the site. Win a 2-Night stay here at SLS Casino on the Las Vegas Strip! William Hill sportsbooks have listed 13 proposition bets at Nevada sportsbooks and the William Hill mobile sports app. Here on SinBin.vegas, we are giving you $100 of mythical money to “bet” on those props. The person who turns their $100 into the highest amount wins a 2-night stay at SLS and 2 tickets to the SLS March Madness party.